I first understood the power of the documentary during the editing of my first film, The Quiet Mutiny. In the commentary, I make reference to a chicken, which my crew and I encountered while on patrol with American soldiers in Vietnam. “It must be a Vietcong chicken – a communist chicken,” said the sergeant. He wrote in his report: “enemy sighted”. The chicken moment seemed to underline the farce of the war – so I included it in the film. That may have been unwise. The regulator of commercial television in Britain – then the Independent Television Authority or ITA – had demanded to see my script. What was my source for the political affiliation of the chicken? I was asked. Was it really a communist chicken, or could it have been a pro-American chicken? Of course, this nonsense had a serious purpose; when The Quiet Mutiny was broadcast by ITV in 1970, the US ambassador to Britain, Walter Annenberg, a personal friend of President Richard Nixon, complained to the ITA. He complained not about the chicken but about the whole film. “I intend to inform the White House,” the ambassador wrote. Gosh. The Quiet Mutiny had revealed that the US army in Vietnam was tearing itself apart. There was open rebellion: drafted men were refusing orders and shooting their officers in the back or “fragging” them with grenades as they slept. None of this had been news. What it meant was that the war was lost; and the messenger was not appreciated. The Director-General of the ITA was Sir Robert Fraser. He summoned Denis Foreman, then Director of Programmes at Granada TV, and went into a state of apoplexy. Spraying expletives, Sir Robert described me as a “dangerous subversive”. What concerned the regulator and the ambassador was the power of a single documentary film: the power of its facts and witnesses: especially young soldiers speaking the truth and treated sympathetically by the film-maker. I was a newspaper journalist. I had never made a film before and I was indebted to Charles Denton, a renegade producer from the BBC, who taught me that facts and evidence told straight to the camera and to the audience could indeed be subversive. This subversion of official lies is the power of documentary. I have now made 60 films and I believe there is nothing like this power in any other medium. In the 1960s, a brilliant young film-maker, Peter Watkins, made The War Game for the BBC. Watkins reconstructed the aftermath of a nuclear attack on London. In other words, the power of this documentary was such that it might alert people to the true horrors of nuclear war and cause them to question the very existence of nuclear weapons. The Cabinet papers show that the BBC secretly colluded with the government to ban Watkins’ film. The cover story was that the BBC had a responsibility to protect “the elderly living alone and people of limited mental intelligence”. Most of the press swallowed this. The ban on The War Game ended the career of Peter Watkins in British television at the age of 30. This remarkable film-maker left the BBC and Britain, and angrily launched a worldwide campaign against censorship. Telling the truth, and dissenting from the official truth, can be hazardous for a documentary film-maker. In 1988, Thames Television broadcast Death on the Rock, a documentary about the war in Northern Ireland. It was a risky and courageous venture. Censorship of the reporting of the so-called Irish Troubles was rife, and many of us in documentaries were actively discouraged from making films north of the border. If we tried, we were drawn into a quagmire of compliance. The journalist Liz Curtis calculated that the BBC had banned, doctored or delayed some 50 major TV programmes on Ireland. There were, of course, honourable exceptions, such as John Ware. Roger Bolton, the producer of Death on the Rock, was another. Death on the Rock revealed that the British Government deployed SAS death squads overseas against the IRA, murdering four unarmed people in Gibraltar. A vicious smear campaign was mounted against the film, led by the government of Margaret Thatcher and the Murdoch press, notably the Sunday Times, edited by Andrew Neil. It was the only documentary ever subjected to an official inquiry -- and its facts were vindicated. Murdoch had to pay up for the defamation of one of the film’s principal witnesses. But that wasn’t the end of it. Thames Television, one of the most innovative broadcasters in the world, was eventually stripped of its franchise in the United Kingdom. Did the prime minister exact her revenge on ITV and the film-makers, as she had done to the miners? We don’t know. What we do know is that the power of this one documentary stood by the truth and, like The War Game, marked a high point in filmed journalism. I believe great documentaries exude an artistic heresy. They are difficult to categorise. They are not like great fiction. They are not like great feature movies. Yet, they can combine the sheer power of both. Guzman’s documentary is about the overthrow of democracy in Chile in 1973 by fascists led by General Pinochet and directed by the CIA. Almost everything is filmed hand-held, on the shoulder. And remember this is a film camera, not video. You have to change the magazine every ten minutes, or the camera stops; and the slightest movement and change of light affects the image. In the Battle of Chile, there is a scene at the funeral of a naval officer, loyal to President Salvador Allende, who was murdered by those plotting to destroy Allende’s reformist government. The camera moves among the military faces: human totems with their medals and ribbons, their coiffed hair and opaque eyes. The sheer menace of the faces says you are watching the funeral of a whole society: of democracy itself. There is a price to pay for filming so bravely. The cameraman, Jorge Muller, was arrested and taken to a torture camp, where he “disappeared” until his grave was found many years later. He was 27. I salute his memory. In Britain, the pioneering work of John Grierson, Denis Mitchell, Norman Swallow, Richard Cawston and other film-makers in the early 20th century crossed the great divide of class and presented another country. They dared put cameras and microphones in front of ordinary Britons and allowed them to talk in their own language. These early British film-makers believed that the documentary should speak from below, not from above: it should be the medium of people, not authority. In other words, it was the blood, sweat and tears of ordinary people that gave us the documentary. Denis Mitchell was famous for his portraits of a working-class street. “Throughout my career,” he said, “I have been absolutely astonished at the quality of people’s strength and dignity”. When I read those words, I think of the survivors of Grenfell Tower, most of them still waiting to be re-housed, all of them still waiting for justice, as the cameras move on to the repetitive circus of a royal wedding. The late David Munro and I made Year Zero: the Silent Death of Cambodia in 1979. This film broke a silence about a country subjected to more than a decade of bombing and genocide, and its power involved millions of ordinary men, women and children in the rescue of a society on the other side of the world. Even now, Year Zero puts the lie to the myth that the public doesn’t care, or that those who do care eventually fall victim to something called “compassion fatigue”. Year Zero was watched by an audience greater than the audience of the current, immensely popular British “reality” programme Bake Off. It was shown on mainstream TV in more than 30 countries, but not in the United States, where PBS rejected it outright, fearful, according to an executive, of the reaction of the new Reagan administration. In Britain and Australia, it was broadcast without advertising – the only time, to my knowledge, this has happened on commercial television. Following the British broadcast, more than 40 sacks of post arrived at ATV’s offices in Birmingham, 26,000 first-class letters in the first post alone. Remember this was a time before email and Facebook. In the letters was £1 million – most of it in small amounts from those who could least afford to give. “This is for Cambodia,” wrote a bus driver, enclosing his week’s wages. Pensioners sent their pension. A single mother sent her savings of £50. People came to my home with toys and cash, and petitions for Thatcher and poems of indignation for Pol Pot and for his collaborator, President Richard Nixon, whose bombs had accelerated the fanatic’s rise. For the first time, the BBC supported an ITV film. The Blue Peter programme asked children to “bring and buy” toys at Oxfam shops throughout the country. By Christmas, the children had raised the astonishing amount of £3,500,000. Across the world, Year Zero raised more than $55 million, mostly unsolicited, and which brought help directly to Cambodia: medicines, vaccines and the installation of an entire clothing factory that allowed people to throw away the black uniforms they had been forced to wear by Pol Pot. It was as if the audience had ceased to be onlookers and had become participants. Something similar happened in the United States when CBS Television broadcast Edward R. Murrow’s film, Harvest of Shame, in 1960. This was the first time that many middle-class Americans glimpsed the scale of poverty in their midst. Harvest of Shame is the story of migrant agricultural workers who were treated little better than slaves. Today, their struggle has such resonance as migrants and refugees fight for work and safety in foreign places. What seems extraordinary is that the children and grandchildren of some of the people in this film will be bearing the brunt of the abuse and strictures of President Trump. In the United States today, there is no equivalent of Edward R. Murrow. His eloquent, unflinching kind of American journalism has been abolished in the so-called mainstream and has taken refuge in the internet. Britain remains one of the few countries where documentaries are still shown on mainstream television in the hours when most people are still awake. But documentaries that go against the received wisdom are becoming an endangered species, at the very time we need them perhaps more than ever. In survey after survey, when people are asked what they would like more of on television, they say documentaries. I don’t believe they mean a type of current affairs programme that is a platform for politicians and “experts” who affect a specious balance between great power and its victims. Observational documentaries are popular; but films about airports and motorway police do not make sense of the world. They entertain. David Attenborough’s brilliant programmes on the natural world are making sense of climate change – belatedly. The BBC’s Panorama is making sense of Britain’s secret support of jihadism in Syria – belatedly. But why is Trump setting fire to the Middle East? Why is the West edging closer to war with Russia and China? In 2017, that silence has returned. It is not news that the safeguards on nuclear weapons have been quietly removed and that the United States is now spending $46 million per hour on nuclear weapons: that’s $46 million every hour, 24 hours a day, every day. Who knows that? The Coming War on China, which I completed last year, has been broadcast in the UK but not in the United States – where 90 per cent of the population cannot name or locate the capital of North Korea or explain why Trump wants to destroy it. China is next door to North Korea. According to one “progressive” film distributor in the US, the American people are interested only in what she calls “character-driven” documentaries. This is code for a “look at me” consumerist cult that now consumes and intimidates and exploits so much of our popular culture, while turning away film-makers from a subject as urgent as any in modern times. "When the truth is replaced by silence,” wrote the Russian poet Yevgeny Yevtushenko, “the silence is a lie." Whenever young documentary film-makers ask me how they can “make a difference”, I reply that it is really quite simple. They need to break the silence. This is an edited version of an address John Pilger gave at the British Library on 9 December as part of a retrospective festival, ‘The Power of the Documentary’, held to mark the Library’s acquisition of Pilger’s written archive. 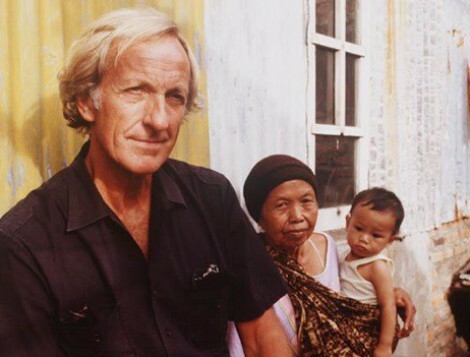 In this episode, we speak to the legendary journalist John Pilger looking back at decades documenting human rights abuse, wars and corruption. Thom talks with author and filmmaker John Pilger about his new documentary “The Coming War On China” and the military escalation that could lead World War III. Julian Assange: "I AM WIKILEAKS" - "About Julian"
Is South Africa heading for civil war? M.T. KESHE: real or fake? VIDEO, REPORTS etc. 1990 Gulf Breeze UFO a confirmed hoax?